This gallery is a smorgasbord of road making and rolling subjects, starting with a heavy focus on the products of Barford & Perkins (because they happen to be a particular interest of mine! ), with specific examples shown and described. I’ve also raided my photo archive to create some other galleries of construction equipment and steam rollers, for those who are interested in such things! More info can be found on steam rollers (and traction engines etc.) on the excellent SteamScenes website. Note: I intend to work on this gallery over coming months, adding information and photographs in order to provide a fairly decent resource, particularly for those interested in motor rollers – I know from my own research how little definitive information is out there on this topic. You will also find a selection of roller literature under the Trade Catalogues section of this site, which I also intend to grow as and when I have time! We start with the numerous and varied Barford & Perkins A Series motor rollers of which over 700 were manufactured across nearly 35 years production. For my own convenience in researching Barford A Series motor rollers (which it will shortly become clear is something of a personal passion! ), I have devised a rudimentary typology based on the very long time this type was in production and the clear model changes across that timespan – the first generation bearing little resemblance to the last (very much like modern cars such as Fiesta or Golf). I have taken David Jenkinson’s approach to London Midland & Scottish Railway coaches as inspiration – his classification being so well known and used now that it has become the de facto means of describing that railway company’s coaching stock, though was not one they, or their successors British Railways, used themselves. The three periods are still very much in a research state, but usefully provide a rough categorisation for the A series rollers. The design was perpetuated by Aveling-Barford after the merger in 1933, and didn’t finally finish production until the ‘G’ *Grantham’ rollers appeared in 1947. 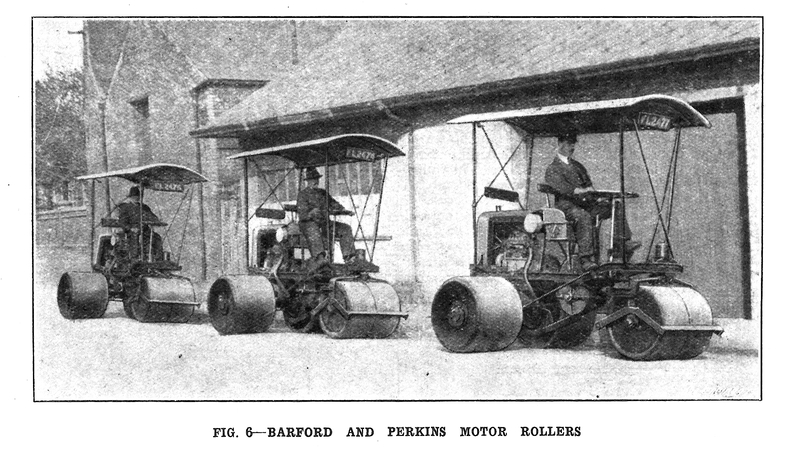 Here we look at the varieties of A Series rollers, using Barford & Perkins own advertising material as a guide to the main types and their accessories. owned by some one in Ravenfield ,Rotherfield. It has appeared on e-Bay a number of times, and I have tried to purchase it on a previous occasion! It is now on display, in running order, at Beamish though remains privately owned and with a rebuilt seat/toolbox matched to the original type fitted. … and more missing plates! CC 002, an “A 2 1/2 with 6′ 0” wide rolls, was new to “Colonel Radcliffe” through “Brindleys Ltd.” and despatched to Burton on Trent 10th December 1928…Its original engine was officially a “Reliance” OE No. 7453. Coventry Simplex design engines were described “Reliance” from mid 1928 in all Barford Perkins records although they were actually made by Brotherhood! Because of this it has been confusing if researchers call them by the latter makers name! The engine number is found in the middle of the cover plate name mouldings immediately behind the carburettor. (These notes courtesy of Bill Dickins). It was built as a model A2.1/2 ton despatched on 22/8/1929 to “W & A Higginbottom, Chester” fitted with a Coventry Simplex ( to quote the Official Spec Sheet but often called “Brotherhood” on the engine test sheet) model BB 4cyl. No. 527B. As normal for this model it was supplied without a awning on its H2021. type frame. Unusually for this period there are no further notes referring to this machine in the Registers. (These notes courtesy of Bill Dickins). The fairly tired radiator has been repaired for further use (pending a full rebuild one day). The core is sound, though the header joints have shown some failure along previous repairs. Seen here being tested. Notes: On display at Stonehurst Farm, Quorn, Leicestershire. AA048 is a Barford & Perkins model “A 2speed with [originally] 6′ 0″ wide rolls and water sprinklers”. New on 23/6/1928 to Borough of Darlington Fitted with a Brotherhood Engine No. 441b. Its original Engine was replaced 8/5/1957 with a reconditioned BXB engine unfortunately no number is recorded in the AB records! However the owners at this time were “Clayton Brothers” again no more info recorded. The Brotherhood engine was the normal petrol engine used in the “A” & “B” type models up to the fitting of Ruston Hornsby Diesel engines when this model became available as a Diesel version. This later was obligatory due to Aveling – Barford being set up on part of the Ruston Hornsby factory site. The Brotherhood make engine has also been known as a “Coventry Simplex” for most of its manufacturered life but some versions became a “Reliance” about 1928 due to the financial status of the “Coventry Simplex Company”. All were actually Brotherhood build – now Perkins Engines at Peterborough. The engine number is behind the Carburettor stamped on the raised plate centre of the Barford Perkins Name. Notes courtesy of Bill Dickins. Notes: Previously at Shildon Vintage Vehicles, last heard of at auction in Clitheroe in spring 2014. Restored with copper bonnets and appears to have sustained major damage to frame and headstock in its life. Notes: In store at Abbey Pumping Station, Leicester. Note PTO take off on offside. Once again, Bill Dickins’ extensive research provides a background: QQ72. An A3 model supplied with A2.5 interchangeable wheels with the Registration Mark FL 9983. Despatched 2/10/1931 to “Burhill Estate Co. Ltd. at Burwood, Walton – on – Thames. It was painted “Red” and was not fitted with a canopy.” There is no further history of this roller in the BP history records. The roller came to me from the Burhill Estate (now a golf club) and has two patches on the bonnet – local recollection was that the grandfather of one of the present staff members on the estate was rolling a road during WW2 when he was strafed by a Luftwaffe fighter. This practice was not unknown and shows the gentleman to have had a very near miss – the entry and exit of the shell/bullet being through the bonnet and missing the seat and any internal components. The roller will be conserved and stripped of some more modern additions, but will otherwise remain in as-found condition. It has received professional attention to ensure it can be operated and further work on the carburettor remains outstanding. This roller, photographed by James West at the Royal Deeside Railway near Aberdeen, was supplied new to Aberdeen Town Council in 1930. This became Aberdeen District Council in 1983, a change indicated on the log book (a copy is shown here). It was restored by Sandy Arbuthnott in 2011/12 and appears to be a very faithful restoration. It is noted as being supplied with wide rolls for conversion to an A3, for use on grass. It has a BBB petrol engine, No.223. Many thanks to James for the photos, taken in August 2014. Notes: Owned and restored to a very high standard by Andrew Eyre. Supplied new to Messers Allnatts Ltd, Chase Estate, Park Royal Road London on the 26th February 1932. It was later used to roll a causeway between the mainland and Osea Island in the Blackwater Estuary. It was saved from scrap in 1976 by Michael Hoyle, later being sold to Angus Cameron. It then passed back to Michael Hoyle before being sold, in dismantled condition, to Andrew Eyre in 2000. Allnatts were a developer, building the Park Royal Estate as one contract. Major Alfred Allnatt bought Osea Island from Frederick Charrington (of brewing fame) in1936 and probably accounts for RR 054’s appearance on the island. Below: A 2 1/2 KK 030 Built 19?? Notes: Owned by Andrew Eyre. Originally fitted with a brass radiator, though alloy one has been substituted. Unrestored but operable. A Rochester built A3 – note the deeper frame section. The Rochester era (a brief period of time in the Barford story) is demonstrated by the wheel type handbrake and quick reverse gearbox. This fuel tank is very unusual – a long range variant perhaps?! It results in a shortened bonnet, fuel tanks usually being enclosed within the engine bay. AB 270 of the early Grantham era (possible later assembly of Rochester components?) with camel hump type fuel tank. Dispatched 10/10/1934. Described on build sheet as having new pattern steering (i.e. non-chain). Note it is a Quick-Reverse type. The original postcard sepia image. PP 012 – a very original looking A3. Note the canopy, the Barford &Perkins name on the radiator header and the ‘Peterborough’ name cast into the rear fame stretcher (they more usually say ‘Barford Perkins’). I would very much like to contac the owner of this roller if anyone knows who it is? I believe it is usually in the Cumbria area? The D series, like the A series, evolved over the years into various shapes and guises. Beamish’s own example, R025, is currently subject to an extensive restoration in our own workshops. Inevitably one looks around for other information on these rollers (and more can be found under the heading ‘Rolling Restorations’ on this site), from which these galleries have been derived. Notes: Currently under restoration at Beamish Museum. Supplied new to the RAF and later sold into private use. Recovered from a scrapyard in Berwick. See more of its history under ‘Rolling Restorations’ on this site. Barford T Series catalogue cover May 1929. Note red livery, black bonnet and alloy radiator. Marshall 8 Tonne Diesel Roller 91413 reg SY 8653 at Bill Etherington auction 14th June 2014. Sold to I. Craggs of Co Durham. Fitted with a Perkins diesel engine. Often overlooked, but equally fascinating, are the implements and tools used in road construction and maintenance. RRA Phoenix tar boiler at Beamish. A selection of views showing roadmaking displays at Beamish and other locations over the last few years. The majority of these views were taken at Beamish, but also Lincoln, GDSF and Onslow Park (Shrewsbury). A selection of local scenes from the Beamish archive.